A fourth man has been charged with murdering a doorman who was guarding a party on New Year's Day. 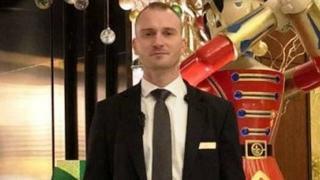 Security guard Tudor Simionov, 33, was attacked outside Fountain House at about 05:30 GMT on 1 January. Nor Aden Hamada, 23, of no fixed address, was arrested on Sunday at Gatwick Airport as he returned to the UK, the Metropolitan Police said. He has been charged with murder and will appear at Westminster Magistrates' Court on Monday. Mr Hamada has also been charged with violent disorder and four counts of grievous bodily harm. Three men - Haroon Akram, 25, Adham Khalil, 20, and 23-year-old Adham Elshalakany - have previously appeared in court charged with Mr Simionov's murder. Detectives are still appealing for information to help find Ossama Hamed, 25, in connection with the investigation.